Random Ronnie Van Zant Quote: Click to View List Entries. Updated news, added release date calendar (below). Uploaded entire web site to this new address. Updated News (please read if you get the chance) Spyn-Off Bands section, Discography, Tour Dates, and others. Added over 30 new songs to the audio page, including the complete 2/5/77 soundcheck, complete Superjam '78 radio show, and more. Added info on the upcoming Van Zant II release as well as Van Zant tour dates. Added 10 new songs to audio page. Added info on new Skynyrd releases. Added some new info on Leon Wilkeson and the Skynyrd Christmas CD. Welcome to my little tribute to the greatest rock and roll band of all time, Lynyrd Skynyrd. Never has a band touched me in so many ways, and this is my way of trying to give some of that back. This site features what I hope is one the most comprehensive Skynyrd discographies on the net. Also, be sure and check out the RealAudio page, featuring live Skynyrd songs you can't hear on official releases. Thank you for coming, and in the words of the late, great Allen Collins, "Have we got a band for you!". Enjoy the ride. 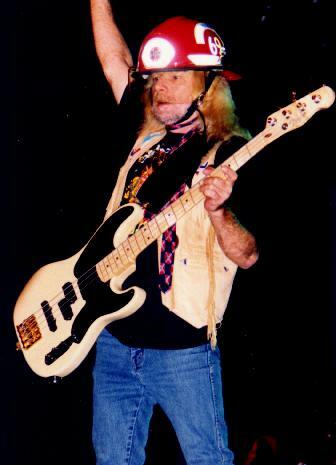 This web site is always dedicated to the memory of Leon Wilkeson, Ronnie Van Zant, Allen Collins, Steve & Cassie Gaines, Dean Kilpatrick, Gary Smalley, Berniece Rossington, Marion Van Zant, and Allen Woody. May they rest in peace and the spirit of the music they helped to create live on forever. I would also like to dedicate this site to Bernard Shuck, Curtis Huff, and S.F. Special thanks to Jimmy Gauldin for creating the graphics at the top of the page. I would also like to thank Joey Hawkins and Willie Cuozzo, for whom without my audio page would not have been possible.